What kind of cable is needed for an amplified antenna? This is one of the most common questions we get. People want to know if the cable they already have will work with their antenna, or they want to know the right kind of cable to get. With a non-amplified antenna, it doesn’t matter very much but if you’re amplifying the antenna at the antenna site… there’s a whole different set of concerns. Don’t go to your local home store and buy RG6 cable. It’s not that I don’t like home stores… I’ve spent enough money there myself. The problem is that the cable that’s sold in home stores lacks a key quality. Let me explain. First thing you need to know is that copper is expensive. It’s more expensive than steel. A manufacturer is only going to use as much copper as he needs. That’s why inexpensive cables use a lot less copper. They do this by using a center wire made of steel, and then copper-plating it. That’s not a bad practice, and it works because of a well-known property of signal transmission called “the skin effect.” In a coaxial cable, the signal only travels on the outer bit of the center cable and not through its center. Therefore it doesn’t matter what the center is made of. It could be made of cotton candy and it would still be a good cable as long as the cotton candy was copper-plated. The easiest way to get that power to the amplifier is to use the coaxial cable. One of the neat things about the way cables work is that the signal isn’t really affected by voltage traveling through it. That’s partially because the voltage travels throughout the entirety of the center conductor wire while (like I said above) the signal only travels on the outer skin. There’s only one problem with this scheme… voltage doesn’t travel terribly well through steel. There’s a lot of loss. In order to power an amplifier, you need the center wire to be solid copper. And that’s where the whole problem of buying cheap cables comes in. Take a look at those cables in the home stores and you’ll find that they all say “copper-clad steel” or “copper-coated steel.” That means they’re not suitable for use with amplified antennas. 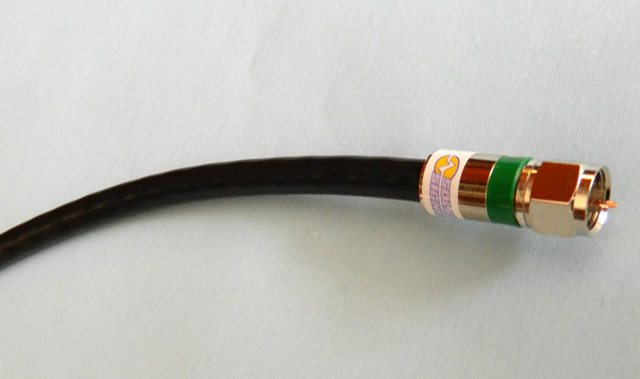 Only cables that say “solid copper center conductor” will work with amplified antennas. The good news is that you can order this cable from Solid Signal by the foot and the prices are really quite reasonable. It’s worth your time to get the right stuff right away. Do you know what this is? If not, your home could be in danger.